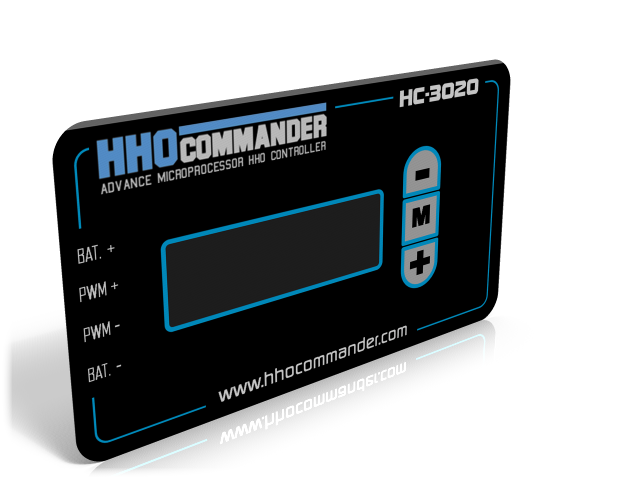 HC-3020 is a unique PWM HHO controller based on high speed CPU processing. It is the first product in the market of HHO controllers based on a high speed Microcontroller and these innovative features offer many extra functions and high measuring and controlling accuracy to the unit. As a result of these features, superior management of your HHO unit is possible along with an extra fuel economy of up to 20%. CPU Microcontroller management.All the metering and controlls make through CPU and internal software routines. LCD screen to read the metering results and mebrane keyboard for setting the working parameters.Very easy and friendly user interface allows to check and manage for efficiency your HHO unit. Smart metering control gives the unit high accuracy on data metering and help you manage and control your unit in any way you prefer much more efficiency. Universal input voltage 10-30V makes the unit suitable to any type of vehicle you like with out having problem with the battery voltage type.The unit can work perfect both 12V and 24V batteries. Hi Load output up to 20A makes the unit can work perfect on any vehicle you prefer from a small car to a big truck without problem. The main job of HC-3020 unit is to regulate the power load of electricity in your H2O system.This can be done using PWM pulse to control and regulate the power load to H2O unit.HC-3020 measures real time the load output and regulates it, to be exactly the same with the setup power load value. The reason that HC-3020 is unique is not the job it does but the way and the technology uses to do its job.It is the first product in the market of HHO controllers based on a high speed Microcontroller and these innovative features offer many extra functions and high measuring and controlling accuracy to the unit. As a result of these features, superior management of your HHO unit is possible along with an extra fuel economy of up to 20%. The reason that HC-3020 can achive better economy up to 20% than other controllers is the interface we use to control the H2O system.Real time metering and controlling can give you very accurate working enviroment.This means in an example that you set the load to 5A and what ever happens or without have to worry about the exactly electrolyte amount in water you can have stable 5A load output.So no need to recalibrate the pwm every time you recharge electrolyte and water or recalibrate for any other reason,one first set up is ok all other can be done automatic from the HC-3020 interface.This accuracy is the reason of extra economy and the reason of the high efficiency of your H2O system. The unit have been design with the filosofy of no settings needed for final user except rarely times and even then the set up of unit can be done very easy using only 3 keys.Final user must forget the way know untill now like: Set up the PWM unit load every time he fills water with electrolyte or have always its eyes on amp meter to correct the load to the desire value.All these is history from now on all these can be done though the HC-3020 unit interface automaticly.Even there is a function to help you with the water / electrolyte mixing rate. It can reduse the questions and problems caused from wrong use of your HHO unit.It is proven that up to 95% of the problems and complains from customers are due to the wrong using of HHO unit or wrong setup values.Our unit will help to stop all these fault matters. You ensure that your customer don’t play all the time with HHO unit set up and creates false problems. Press on the link on the right to download the latest user and installation manual.